Rather spoiled for choice for live music in Glasgow this week. Here are a couple of brief live gig reviews of some of the bands that I took in. It is a real treat to see Saint Etienne and Belle and Sebastian play within a few days of each other, two standards on any playlist I would put together in my student days. Both bands demonstrate their "indie" credentials by being named respectively after a French football team and a French children's book of the 1960s. 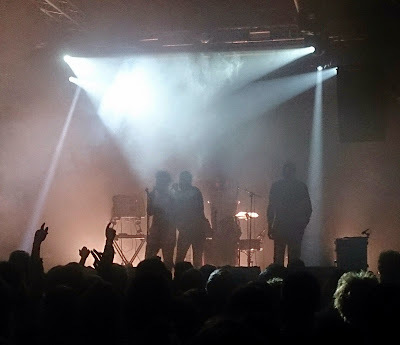 Between these two gigs I also this week got the chance to see the excellent Young Fathers again, who seemed like a sharp, refreshing double espresso between two sweet cups of cappuccino. There is a lot more interest in the nostalgia days before every aspect of our lives was recorded and shared with the world, but I found the film itself a bit sentimental. It recalled London from the 1950s to the early 1980s with Ian McShane's jocular narration. There were interesting wee nuggets, a well dressed woman tottering in high heels through a demolition site, steam trains being dismantled during the Beeching cuts, but the music and pictures were creating an atmosphere, rather than telling a story. It all felt a bit clean and wholesome. I think we've just been spoiled a bit with King Creosote doing a similar thing alongside Virginia Heath with their film From Scotland With Love. That film, made from Scottish film archives, seems to much more successfully capture real people and real places, with no cod narrator, but the music providing a strong element of storytelling. 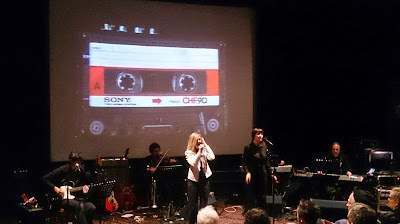 This was followed by the band, fronted by Sarah Cracknell playing a fair few from their back catalogue. Great though their tunes are, it was funny to hear songs that I used to dance along to in Level 8, whilst sitting in a comfy seat in a cinema watching the band play on the carpeted area below us. It was a bit too much for one or two middle aged male groupies who squealed nonsensically at Sarah Cracknell, who didn't have the height a stage would usually give to allow her to be kept away from them. I cringed on her behalf as she politely tolerated it. Their tunes have stood the test of time however and were great to see performed. Edinburgh's finest pop/rock/hip hop act, Young Fathers arrived back on these shores again after a recent tour in the USA. Their latest album, White Men Are Black Men Too, is a fantastic listen, but seen live they take it up a notch. The surprise, but deserved winners of the Mercury Music prize last year their music is as hard to categorise as they are. A mish-mash of influences is what you should expect from a band consisting from a boy Drylaw, a Liberian who arrived in Edinburgh via Ghana and a Edinburgh-born son of Nigerian parents. Their "Young Fathers" moniker apparently comes from the fact that they all share their father's first name, a clever play on words that their songs enjoy too. They are angry, sweaty and have got something worth listening to. Driven on by their energetic drummer they barely pause for breath. I think this is the third time that I've seen them live, and in the sold out hall at the Art School in Glasgow they now seem to have a following that knows their music, and wants to singalong. They battered through a slick, well rehearsed set, dropped the mic to the stage, then walked off. No chit chat, no laughs, it's all about the music. By contrast to Young Fathers, Belle and Sebastian have never been about the energy levels, but more about the feeling of a shy friend talking about his life from his bedroom. The first time that I saw them live was in 1998 when they played in Maryhill Community Central Halls, a kind of warm up gig for a tour I think. It was an easy crowd, with their most adoring fans sat cross legged on the floor near the stage, and their aunties and uncles nearer the back of the hall. At that gig, occasionally they'd stop when one of the band made a mistake, they'd all apologise to each other politely and decide what song to play instead. Next time I saw them was a few years later when they played the Barrowlands, a venue that suited them down to the ground, packed out with adoring fans. The intimacy of their music worked well in that space, with local couthiness supplied by Gavin Mitchell coming onstage to do his Boaby the barman routine from Still Game. Now on the home leg of their current tour they are playing the 10,000 seater SSE Hydro on a Friday night, accompanied by the Scottish Festival Orchestra. Their current album, Girls In Peacetime Want To Dance, takes them in a different direction, as if they have been listening to a lot of Pet Shop Boys music recently, hinting at a grander sound and performance. Like Saint Etienne, we start off with a nostalgic film as the hall is beginning to fill. The film, Glasgow 1980, is worth watching if you've never seen it. It was commissioned by Glasgow Corporation in 1971 like a propaganda film, looking forward to the brave new world ahead once all the slum tenements were cleared and we were all living in clean, airy tower blocks and getting about on motorways. It is directed by renowned photographer Oscar Mazaroli and produced by Bill Forsyth and can be watched on the Scottish Screen Archive website. The Hydro is a massive space which the band and their orchestra tried to fill with bombast, flashy video screens and enthusiasm. It was good to see Mick Cooke back with the band, as one thing that I missed on the current album was his brass playing. He seemed to have come back to help with the musical arraignments with the orchestra. They played surprisingly few songs from the new album, sticking to reliable old favourites. Sadly no room on the setlist for my own favourites (Fox in the Snow and The Stars of Track and Field) but The Boy With the Arab Strap was accompanied by audience and orchestra members invited onstage to dance. I really enjoyed the concert, sat with a smile on my face the whole way through, but 100-times over would have preferred to see them back in the Barrowlands. The vast standing area seemed to be filled with many people just standing, so I don't know what the sound or atmosphere down there was like, but it looked a bit flatter than you may have hoped. The best moments tended to be when you got some intimacy with the band, talking about writing Dear Catastrophe Waitress in the old Grosvenor Cafe, or another song on the number 44 bus (which used to take me home to Knightswood from the city centre - a bus route that seemed to attract eccentric passengers such as the woman who would sit her tortoise on her shoulder "as it likes to look out the window"). It was a great concert, they have a fantastic back catalogue of songs, but I am not sure they really should try to be a stadium rock band.